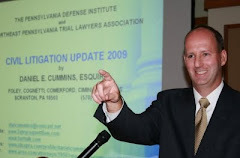 In a decision issued back on February 14, 2011, Judge Joseph Cosgrove of the Luzerne County Court of Common Pleas addressed Preliminary Objections to a punitive damages claim contained in the trucking accident case of Overman v. Fraser, et.al., No. 9225-Civ-2010 (Luz. Co. Feb. 14, 2011, Cosgrove, J.). According to the opinion, at the time of the motor vehicle accident involved in this matter, the Plaintiff was working on traffic lights from the bucket of a construction vehicle parked in a clearly marked construction area. The Defendant truck driver, operating a tractor trailer, came through the construction area and struck the bucket and then the Plaintiff’s vehicle, resulting in injuries to the Plaintiff. Judge Cosgrove noted that the “essence of Plaintiff’s demand for punitive damages centers on [the truck driver’s] status as a professional driver operating such a substantial vehicle in a way which caused this collision in a construction zone.” The Plaintiff also asserted that the owner of the tractor trailer was responsible for permitting the tractor trailer driver to operate the vehicle when they knew or should have known was unable to do so properly. Relying upon the Federal Middle District Court decision in the case of Grosek v. Panther Transp., Inc., 2009 W.L. 427, 238 (M.D. Pa. 2009), a case involving similar punitive damages claims, Judge Cosgrove essentially ruled that the involvement of a larger vehicle being operated by a driver with experience and training and safety required the Court to find that the Defendant had not met their “heavy burden” in support of the Preliminary Objections seeking the dismissal of the punitive damages claims. Another recent, local decision allowing a punitive claim to go forward beyond the Motion for Summary Judgment stage is the November 3, 2010 decision by Judge Carmen D. Minora in the case of Riese v. C&M Sales, Inc., No. 06 CV 6281 (Lacka. Co. Nov. 3, 2010, Minora, J.). In Riese, however, there were more substantial allegations of safety violations and reckless conduct on the part of the Defendant truck driver and Defendant owner of the trucking vehicle involved. Anyone desiring a copy of the Overman decision by Judge Cosgrove or the Riese decision by Judge Minora may contact me at dancummins@comcast.net.